It’s All Up In The Air…Birds that is! I started collecting birds about two and a half years ago while on a cabin trip in NC with friends. My girlfriend and I vistied a roadside flea market and I picked up a chubby little porcelain bird and thought it was the cutest thing. It soon became known as the “peace birdie” with my girls, who were nearly 2 and 3 years old at the time. I told them it may fly away if they couldn’t keep the peace amongst each other (well it worked for a short while anyway). Ever since then, I’ve been picking them up here and there. To me, they symbolize the greatest freedom…who doesn’t dream of just soaring through the air with the wind in your face. Lately, I’ve been seeing their inspiration all over the runway and in the home. I don’t typically style for the current trends, but birds always have and will always be around…they’re timeless and add a little bit of whimsy to our home. I’d like to share a few pieces that I have. 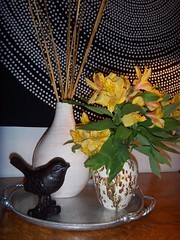 1) Black metal bird perched on a branch, great as an accent and weighes about 2-3lbs, $12. 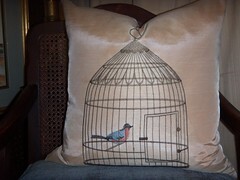 2) Feather down birdcage pillow, new $25. 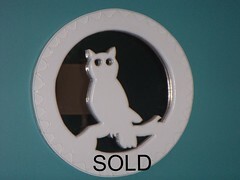 3) Hand-made owl mirror signed and dated on back, May ’81. I found this unpainted and updated it with a few coats of glossy white paint, measures 17″ in diameter. Like a little piece of folk art, SOLD. 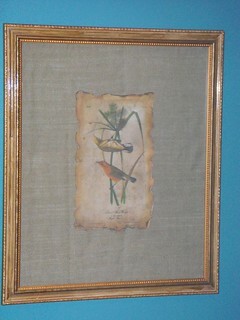 4) Custom art made from a spare frame painted gold, a piece of burlap and a vintage inspired bird print. It measures 20.5 x 24.25in framed, $40 obo. If you have any questions or would like to purchase, please call or email me: 843.478.0706 or sharon@sharonpayerdesign.com. I will deliver locally! As always thanks for looking and remember REUSE THE BEAUTY OF THE PAST TO CONSERVE WHAT WE HAVE FOR THE FUTURE. Additional “picks” at STYLE REVIVAL in the Antiques Market on Coleman Blvd. 75 Responses to It’s All Up In The Air…Birds that is!